Congestive Heart Failure happens when the heart is not able to pump enough blood to meet the demands of the body. The heart has only 1 main function which is to circulate blood all throughout the body. If something reduces the hearts ability to pump and circulate blood, symptoms of congestive heart failure occur. In some cases, the overall squeezing strength of the heart is reduced causing each heartbeat to pump less blood. This is measured by the "ejection fraction" of the heart which is normally greater than 55% (at least 55% of the blood leaves the heart with each heartbeat). This is called "systolic congestive heart failure". In other cases, the heart can squeeze strong, but simply is not able to relax to fill the heart with blood. This also results in a reduced ability of the heart to circulate blood and symptoms of congestive heart failure and is termed "diastolic congestive heart failure". As the pumping ability of the heart decreases and congestive heart failure develops, the pressure inside the chambers of the heart increase. These high pressures are eventually transmitted back into the lungs and the rest of the body causing the lungs to fill with water and fluid to build up in the body. This results in the symptoms of congestive heart failure such as shortness of breath and swelling in the legs. Why do I have congestive heart failure? Anything that lowers the heart's ability to pump blood can cause congestive heart failure. The term "CardioMyoPathy" is frequently used. "Cardio" means heart, "Myo" means muscle, and "Pathy" means disease, so cardiomyopathy just means "Heart Muscle Disease". Coronary Artery Disease and Heart Attack: This is called an "ischemic cardiomyopathy" and is the most common cause of congestive heart failure. When a coronary artery gets completely blocked by cholesterol/calcium plaque or a blood clot, the blood supply to the heart muscle is cut off and the heart muscle can weaken or permanently scar causing congestive heart failure. Heart Valve Disorders: The job of the heart valves is to open with each heartbeat allowing blood to flow forward and then close to stop blood from leaking backwards. If a heart valve is not opening well (stenosis) or is leaking blood backwards (regurgitation), then the overall ability of the heart to pump blood forward will be reduced and congestive heart failure will occur. Viruses: A "viral cardiomyopathy" can be caused by many viruses including those that cause the common cold, the flu and mono. In susceptible people, these viruses attack the heart muscle cells directly causing the heart to weaken. Most people who get these viruses do not have any damage to the heart, however some are more susceptible than others. Alcohol: Heavy alcohol consumption can damage the heart muscle cells and cause the heart to weaken. Genetics: There are many known genetic mutations that result in the heart being weak and congestive heart failure. If congestive heart failure occurs at a relatively young age in many of your family members despite no other reason (such as heart attack), then a genetic heart failure may be present. Arrhythmias: If the heart is beating too fast or too slow, the heart will not be able to pump blood effectively and congestive heart failure will develop. Stress on the heart: When the heart has to consistently beat really hard and really fast, it eventually gives out. An overactive thyroid or severe anemia (low blood count) can do this. In general, this is not a common scenario. There is also a rare disorder called "stress induced cardiomyopathy" where a sudden stress, such as severe emotional upset, can temporarily weaken the heart. This is more commonly known as "broken heart syndrome". Idiopathic: This simply means "we don't why". Thus, an "idiopathic cardiomyopathy" is when congestive heart failure occurs without any identifiable reason. Diastolic Heart Failure: When the heart strength remains strong, but the heart fails to relax well, the overall output of the heart decreases and congestive heart failure occurs. This is most common with long-standing high blood pressure (hypertension) or aging of the heart, but can occur with other rare disorders called "restrictive cardiomyopathies". Chest x-ray: A simple chest x-ray can see fluid in the lungs or enlargement of the heart. Echocardiogram: This is the best and most thorough test to examine the heart including the heart strength, heart valves and the pressures within the heart. It is a painless test without any radiation exposure. A technician will examine your heart with ultrasound and the entire test takes about 30 minutes. Stress test: A stress test helps to diagnose a coronary artery blockage as a cause of congestive heart failure. Sometimes treadmill exercise is used and sometimes medications are used to stress the heart and see if the heart muscle is getting enough blood flow. If there is an area of the heart muscle found that is not getting enough flow, then a coronary artery blockage may be present. Shortness of breath: The body needs more blood flow during physical activity, but when congestive heart failure is present, the heart simply is not able to get enough blood to circulate. Pressure builds up in the heart and backs fluid into the lungs causing shortness of breath. Also, shortness of breath frequently occurs while laying flat. When sitting upright, gravity pulls fluid down to the abdomen and legs, however when laying flat, fluid can fill in the lungs more easily. People with congestive heart failure may feel more comfortable sleeping with many pillows or in a more upright position at night. Swelling in the legs: This is called "edema". When the heart is not pumping enough blood to the kidneys to make urine, fluid can be retained in the body. Gravity pulls the extra fluid in the body down to the legs since most people have their legs toward the ground most of the day. Fatigue: When the heart is not pumping enough, people simply feel tired. Other symptoms: In certain instances, cough can occur from fluid in the lungs, appetite may be poor, pain in the liver (right upper abdomen) may be present and symptoms of irregular heartbeats can occur such as dizziness and passing out. What medications are used to treat congestive heart failure? Beta-blockers (i.e. metoprolol and carvedilol): These medications block adrenliline. When the heart is not pumping enough blood, the body's natural response is to increase the level of adrenaline in the system to make the heart pump harder and faster. When there is an actual disease of the heart (like a heart attack), this adrenaline actually has negative effects and can stress the heart too much making the heart even weaker. Therefore, beta-blockers are used to block the adrenaline, take the stress off the heart, and allow the heart to heal. A low dose is usually started initially and then slowly increased until the maximum benefit is achieved. ACE Inhibitors or ARBs (i.e. lisinopril and losartan): These medications block certain kidney hormones. When the kidneys detect that the heart is not pumping enough, they overproduce certain hormones which further stress the heart and make you retain fluid. This has many negative effects and thus ACE inhibitors and ARBs are used to block this kidney hormone response once again allowing the heart to heal. These medications are also started at a low dose then increased until the maximum benefit is achieved. Diuretics (i.e. furosemide or Lasix): Also known as "water pills", these medications force the kidneys to make urine allowing you to eliminate the extra retained fluid. Digoxin: This is an old medication first found in the foxglove flower. It works to increase the squeezing strength of the heart relieving symptoms of congestive heart failure. Why does congestive heart failure sometimes get worse? Drinking too much fluid: Everything you drink including water, juice, mild or any other liquid gets absorbed by your intestines into your blood stream. It them makes its way to the heart which has to pump it. When the heart simply can't pump enough, the pressure increases in the heart and the fluid will "congest" in the system, causing an exacerbation of congestive heart failure. People with congestive heart failure should only drink with thirsty and limit fluid intake in general to about 2 liters daily (one-half gallon). Watching your weight on a scale daily is crucial to monitor if fluid is building up. Taking extra diuretics as directed by your physician when the weight increases can help improve your symptoms and prevent you from having to go to the hospital. Eating too much salt: When you eat a lot of salt (sodium), water retains in your system. Also, eating too much salt makes you thirsty so you drink more fluids. Not taking your medications: When people are taking diuretics (water pills), the increased urination can be bothersome. This results in some people intentionally not taking their medications. Eventually, the fluid may build up in the system making the congestive heart failure worsen. Be sure to take your medications as prescribed. If you have concerns about side-effects or other issues, contact your doctor immediately. Arrhythmias: If the heartbeat starts to go too fast or too slow due to electrical problems in the heart, the overall output of the heart may go down and cause congestive heart failure to worsen. Heart failure worsening: Sometimes the actual cause of the heart failure (coronary artery disease or heart valve disease) simply gets worse. If there is no explanation why the congestive heart failure is worsening, further testing may be needed to find out why things have changed. Illness: Any illness that requires the heart to pump more blood can cause a heart failure exacerbation. Examples include infections such as pneumonia or flu, anemia (low blood count frequently from bleeding) or COPD/emphysema exacerbations. What other therapies are available to treat congestive heart failure? Controlling other factors: Making sure the heart can pump effectively helps improve congestive heart failure. Treating hypertension and controlling irregular heartbeats allows the heart to pump better. Preventing stresses on the heart such has heart attack, infections or anemia is also important. Defibrillators: A defibrillator is a small box that is implanted under the skin in the upper chest with a wire attached that feeds through a vein and into the heart, similar to a pacemaker. A defibrillator watches the heartbeat closely and will deliver a shock to the heart if a life-threatening arrhythmia occurs. In general, when the heart strength (ejection fraction) remains less than 35% despite medications, a defibrillator is beneficial as the risk of arrhythmia is high in this setting. It is important to note that defibrillators do not increased the heart strength or improve symptoms, they just treat arrhythmia IF it occurs. This is similar to an insurance policy. Car insurance does not make your car faster or better, but is there to cover you if an accident occurs. 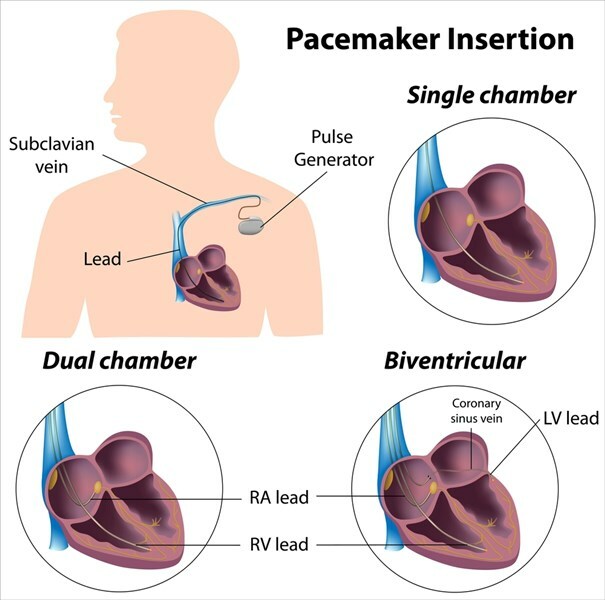 Left Ventricular Assist Device: This advanced therapy is for severe life-threatening heart failure and is essentially an artificial heart. Heart Transplantation: A last resort therapy for congestive heart failure, heart transplantation is rarely needed.